Let’s start with lesson 19, containing proverbs 181-190. Literally: to put a full stop (or “period” in US english). The meaning is to finish or to quit something (and not return back to it). It is often used when someone talks about his career. For example, the football player ended his career: hij zette een punt achter zijn voetbal-loopbaan. Literally: to stand with his back against the wall. The same as in English. You use it when there is a serious situation with only a few ways to get out. It is often used to justify some action, which one would not do in a normal situation. When we say “klappen” in Dutch, we usually mean to clap in your hands. However, the translation here is: to talk. In the Netherlands this second meaning is not used anymore, but in some Flemish dialects it is. So, the literal translation of the expression, is to “talk out of the school”, referring to what children told about what happened at school. The meaning of this expression is to tell something what should not have been shared publicly. Literally: a cigar from his own box. The expression is used, when one offers something to someone else, while the receiver is actually the one who paid for it. It looks like a present, but it is not. For example, a company may offer you a nice present to use their services. But in the end, it is not really a present, it is paid from the money of the customer. Literally: to get a tail. The meaning of this saying is, that it is likely there will be some discussion later about it. Normally it is used in the case of a positive event, but with some element that could be contested at a later stage. For example, a city administration organises a nice party, but the costs appeared twice the original budget. Literally: to have a stick behind the door. The origin of this expression was rather negative, as “the stick” refers to something you can use to beat someone else. For example in case the other person did not act according your request. So “the stick” is seen as an extra measure to thread with. The current meaning is actually more positive. It is like a back-up, or extra measure you can use to achieve your result. Not a thread, but more like an extra motivation. So even a “bonus” to achieve the company goals could be regarded “een stok achter de deur” (a possible extra measure when you see you’re a little behind on the target – to push the result in the right direction). Literally: to show his teeth. You use the expression when you are not afraid, to show you are ready to defend yourself. The origin of the expression is the way some animals act, to give a signal to someone who threatens. Literally: to reach a quieter waterway. The saying is used to express the end of a hectic period. For example if the stock exchange stabilises on a certain level, after a period with heavy ups-and-downs (periods that could be classified as rollercoasters). Literally: it is not a grease cup. You say it in a situation when a job is not paid very well. It is not going to make you rich. Literally: to give your business card. Of course you can use it literally. But it is also an expression to use when someone does something extremely well, at a moment when nobody actually heard of him. For example, if a new player in a football team scores 3 goals in his first match. Or a young politician has a won a debate. Then you can use: he gave his business card. Not yet time to put a full stop. Finish the course; start using proverbs to the Dutch, and it will be like giving your business card. Do not forget to share this video on social media, and put thumbs up in YouTube. 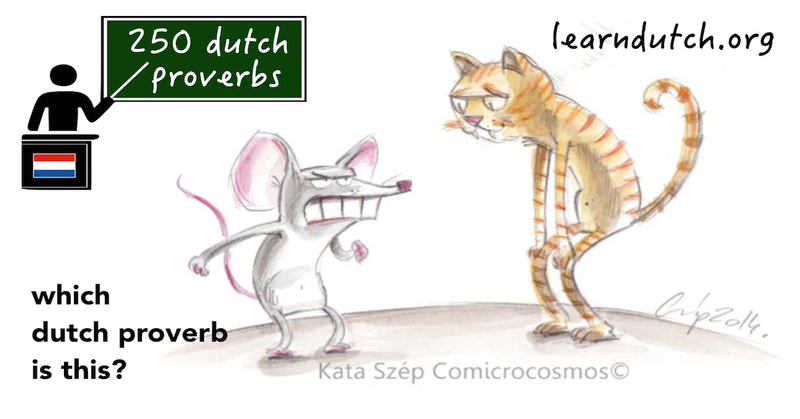 See you back in lesson 20 of 250 Dutch Proverbs.